Located in Voorhees, NJ, We Buy All Cars in New Jersey offers the best way to sell your car. We Buy All Cars has been the state’s leading independent car buying agency for the last 35 years, and we want to buy your used car or truck in any condition. We offer the ultimate guide to selling your car and we continually update and add to our guide which will help you through every step of the car selling process. Whether it’s exchanging titles, updating and transferring your insurance policy, or even getting a honest quote – we have you covered. You can get a quote online NOW by entering your basic info: name, phone number, email, and the year, make, and model of the used car you want to sell. If you prefer to speak to someone in-person, simply fill out our contact form and someone from our team will get back you to shortly to answer your questions as well as generate a fair-market quote for your car. You can also call us directly any time at 1-856-834-5558. Once you’ve received your quote, bring in your car to our office in Voorhees, NJ or take advantage of our free towing and pick-up services for vehicles too damaged to start. Our appraisal process is designed to get you in the door and out with cash in your pocket, hassle-free, in no more than 20 minutes. We Buy All Cars is also capable of taking over any existing financing on your vehicle. We’ll pay you the balance on-the-spot. What Kind of Paperwork Should I Have Prepared When I Sell My Car in New Jersey? The good news is the process for selling used vehicles in the state of New Jersey is a pretty simple and straightforward process. Remove your car’s license plate. If it’s being transferred to another vehicle, that’s fine – you can go ahead and put it on another car that you own – otherwise you’ll have to surrender it to an office of the NJ Motor Vehicle Commission (MVC). Sign the back of the car’s title and list the odometer reading. Get together the other documentation if applicable – like the paperwork corresponding to any liens or if the vehicle is exempt from sales tax. 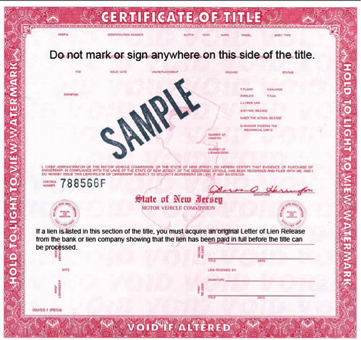 If you’ve lost or damaged your title beyond repair, it’s a $60 fee for a new one in NJ. You’ll have to submit an application for a duplicate via Form OS/SS-52 through the MVC. If you’ve lost or destroyed your car’s registration, visit your local MVC office with a photo ID (preferably your driver’s license), Be prepared to pay the $5 fee. Fill out and submit an application for a duplicate via Form BA-49. Sell your car quickly and easily at We Buy All Cars. You’ll transfer the title to us at the time of the sale. Our team has been in the used car business for decades and will help walk you through the process and paperwork. They can explain the bill of sale, which will serve as your proof of the transaction. Most importantly – they’ll make sure you leave with the most money possible in your pocket. The team at We Buy All cars in NJ has spent years cultivating the reputation for presenting offers on used cars and trucks at fair-market value. These offers will always exceed what you can expect to get from a dealership. We’ll purchase your vehicle as is, so there’s no cleaning or repairs you need to make in order to leave our offices with a check in your hand.